Wikipedia notes that “Liniment is a medicated topical preparation for application to the skin. Sometimes called balms, liniments are of a similar or lesser viscosity than lotions and are rubbed in to create friction, unlike lotions, ointments or creams. Liniments are typically sold to relieve pain and stiffness, such as from sore muscles or arthritis. These are typically formulated from alcohol, acetone, or similar quickly evaporating solvents and contain counterirritant aromatic chemical compounds such as methyl salicilate, benzoin resin, or capsaicin. Liniments have been around since antiquity. Excerpt from A Twentieth Century History and Biographical Record of Branch County, Michigan by Henry Park Collin, 1906, pg 380-382. Endorsement for Kitchel’s Liniment, Showing Barney Oldfield Riding a Bicycle, 1896. Automobile racing legend Barney Oldfield began his racing career on two wheels. In 1894, the sixteen-year-old Ohioan entered his first bicycle race — he finished second. Over the next several years, the young cyclist competed in a number of competitions throughout the country. The budding showman also found time to promote various products, like Kitchel’s Liniment. Page from The Horse Review, Volume 32, by J.C. Bauer, 1905, pg 892. Thanks for this great article. I just purchased a vintage liniment bottle and this really helped in researching it. 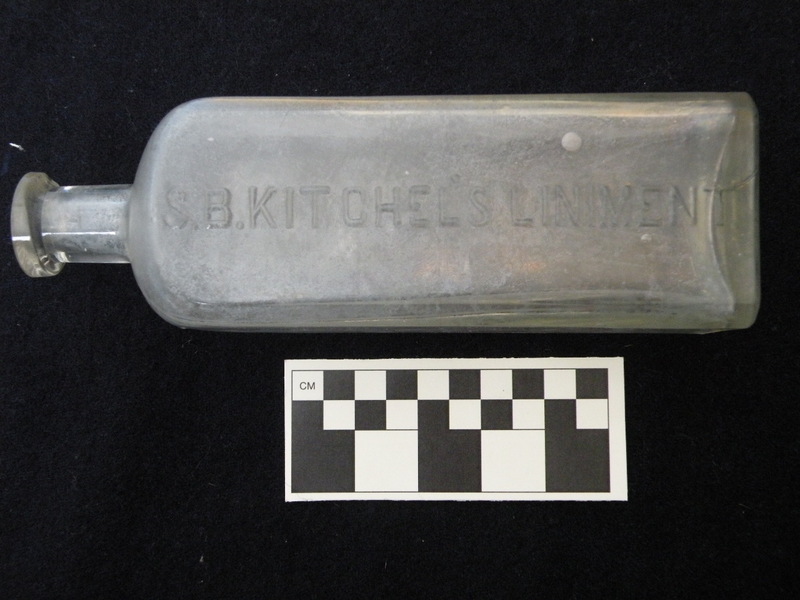 Just bought a Kitchell’s Liniment today, a large 9″ one! Thanks for the info! This page was very helpful. I’m a collector of Michigan medicines and I have all the S. B. Kitchels products he made Windpuff cure , hair tonic cure, spavin cure I would like to use some this information. In a book I’m writing a book on Michigan medicine’s in the future. I would like to use some of this. Let me know when your book is out so I can look for it. Thanks for reading!